Door chimes are rising in popularity in most households, and they are available in both wired and wireless models. If you are a person looking for a wireless door chime, or you cannot afford to lose your visitors, the Ge 19300 wireless door chime is all you need. The product is made with great innovation to greet your visitors at any time of the day with charming and lovely tunes that include rock, classics and a wide range of melodies. The Ge 19300 wireless door chime is easy to install in multiple doors, and it is a programmable door chime that you can personally program the sounds and give a whole new feel in your home. This door chime is the perfect way to skip the messy wired chimes and start enjoying the impressive wireless chime. It comes with a wireless chime and two buttons that are easy to operate. The good thing is that the chime has an adjustable volume ranging from low, medium and high volumes to suit your preference. 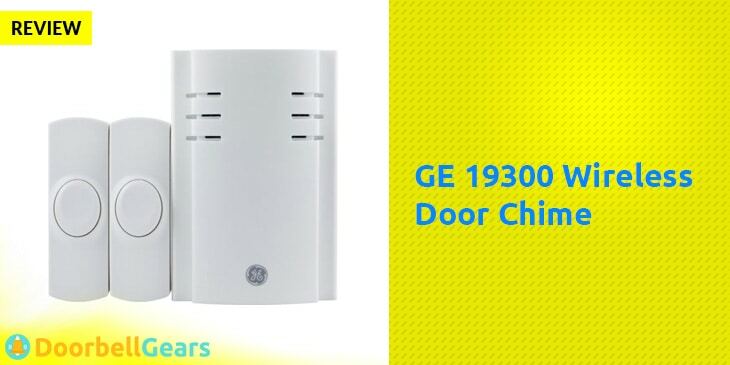 The Ge 19300 wireless door chime is easy to install since it does not require wiring. You can install in multiple doors without requiring you to hire more than one expect since he or she will only need a few minutes to install it. Its installation is easy in that you can also personally install it after reading the manual provided once you purchase it. The Ge 19300 wireless door chime is easy to operate, and it does not require technical training. All you need is to go through the easy to understand manual provided, and you are good to go. The manual provides you with easy steps to follow to program the door chime with the tunes and adjust the volume that you prefer, and you only require to read the manual once since the steps are simple. The chimes are made in such a way that they can serve for as long as ten plus years since the tunes are up to date, and the customer’s preference is at the top of their priority to give your home a whole new feel. The chime comes with two battery operated push buttons but if you need additional buttons, you can purchase them separately. Additionally, you will also get one plug-in chime. The Ge 19300 wireless door chime comes with a variety of melodies in the chime that can be programmed easily. The melodies include Mozart, ding-dong, Westminster, knocks, good vibes, patriotic, tango, and fanfare. The buttons are set in such a way that each can have a different tune to differentiate location example the back and the front door. The chime volume is easy to adjust. It is wireless thus no wiring is required. It has a variety of tunes to suit the customer’s preference. Can be used along with more than two push buttons from the manufacturers. You can only program one tune at a time. Q: Is it possible to add more tunes in the chime? A: No, the device cannot receive nor send tunes from or to another device. Q: Does the door chime withstand rain or extreme weather conditions? A: No, it should be kept in a place that it is not directly exposed to rain or sunlight as it can fade or even short out once rain gets into the buttons. Q: Does it come with a range of colors? A: No, currently the product comes with only one color that is white. Purchasing the Ge 19300 wireless door chime is a choice that you will never regret making since the range of melodies in the chime and its volume is loud enough and it is lovely to change the environment of your home. The durability of the product is guaranteed, and it comes with a one year warranty. All you need to do is install and keep it at the conditions mentioned in the manual that is provided, and it will serve you. The package comes with one chimes receiver and two buttons and where necessary one can add other buttons. The buttons use 3 C batteries.